Q : How do I purchase a voucher (e-ticket) for the pass? A : If you have entered all the required information, including pass type and your personal information on the reservation page, your reservation is complete. To proceed to purchase a voucher, enter your credit card information. Q : How early can I reserve a KORAIL PASS? A : You can make a reservation up to 1 year in advance. Your reservation will be automatically canceled if you do not redeem your voucher for the pass within 180 days. You can book and purchase a voucher online with your credit card. Q : How do I cancel my reservation? A : You can cancel your reservation by using the reservation number you have received in the booking process. Q : Is there a fee for cancellation? A : There is no fee for cancellation. Q : I made an online reservation, but did not redeem the voucher. A : You need to redeem your voucher for a KORAIL PASS within 180 days from the date you made your reservation. After 180 days, your reservation will be canceled automatically. No cancellation fee will be charged. Q : I have made a reservation. Can I change the pass type? A : No. To make a change in your reservation, you need to cancel your reservation and make a new one. Once your reservation is complete, you can change only your personal information. Q : I reserved a ticket. But I can’t find my reservation. A : Your If you do not redeem your voucher within 180 days from the date you made the reservation, your reservation is automatically cancelled. Q : How do I redeem my voucher (e-ticket)? Q : What happens if I lose my voucher? A : You can enter your reservation number on the reservation page and reprint the voucher. If you can’t reprint it, go to the nearest ticket counter in Korea and get another copy of it. Q : What happens if I lose my KORAIL PASS? A : The KORAIL PASS cannot be reissued. Trains available Economy class of every kind of train including KTX(except subways in and suburban Seoul and sightseeing trains). In case of first class or sleeping car, 50 percent discount is offered. 1. 1.“ e-Ticket,”the ticket that can be electronically exchanged with a KORAIL PASS, is issued to travelers purchasing train tickets at the English Website of KORAIL (www.letskorail.com). This is a voucher ticket that can be exchanged with a regular ticket at the designated KORAIL counters. 1. 2. This voucher, issued through the KORAIL online system, must be exchanged with a KORAIL PASS before travel. 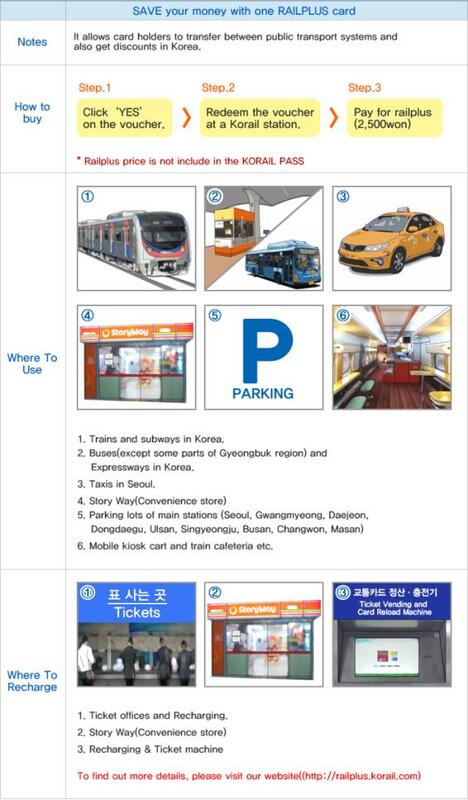 You can exchange the voucher with a KORAIL PASS at the main stations or at every station office in Korea. At the time of exchange, please show the credit card that was used for the payment, and your passport. The dollar price of the voucher can differ depending on the exchange rates at the time of purchase. When you purchase an e-Ticket,the price in South Korean won (￦ KRW) will be applied. 1. 3. KORAIL PASS is a registered pass that cannot be used by any other individual whose name does not match the information on the voucher.You may not purchase more than two passes for yourself per reservation. 1. 4. Reservations can be made as early as one year before the entry. Be sure to enter accurate passport and credit card information (as of this time, we accept five credit cards “VISA, MASTER, AMEX, DINERS and JCB”) for reservation and identity confirmation when you reserve(purchase) an e-Ticket from the KORAIL Website(www.letskorail.com). Please note that you must purchase a ticket at least five days before your arrival in Korea. 1. 5. Limitations : KORAIL PASS is available only to foreigners and not to Korean citizens. Korean travelers with PR passports, foreign citizenship, and long-term visas, however, can also use the pass. ▶Q : For how long is an e-Ticket valid? 1. A : Passengers must exchange their e-Ticket at an official KORAIL exchange office within 60 days from the date of the completion of its purchase. When this period of validity expires, the transaction will be automatically canceled. No cancellation fee will be charged. ▶Q : Can I purchase the e-Ticket from other websites? 1. A : No. e-Ticket can be purchased only from the KORAIL websites. ▶Q : May I purchase an e-Ticket under someone else’s name? 1. A : No. You can purchase an e-Ticket only under your own name. If you are traveling with five persons or less, you can buy a SAVER PASS under your name with a 10% discount. Among the KORAIL PASS types, it is the SAVER PASS that applies to a group of two to five travelers. We offer you a 10% discount (per pass) on the price of a REGULAR PASS. When you reserve a SAVER PASS, you will not be counted among your traveling companions. When you reserve a SAVER PASS, you will not be counted among your traveling companions. Please enter the names of one to four persons as your companions (not including yourself). ▶Q : I want to travel with my family. My family consists of two adults, one student, and one child. Which pass will be more advantageous for us? 1. A : For your family, purchase one SAVER PASS(for two persons), one YOUTH PASS, and one CHILD PASS. • YOUTH PASS: juveniles of age 13 to 25 and youths with International Student Identification Card may use this pass.